There’s one product that mechanics, detailers, and dealers everywhere keep in their arsenal of “quick fix” tools. And it’s sitting on the shelf of your nearest retailer. Automotive Protectant, a surface treatment, is formulated to protect against harmful UV rays that cause discoloration, fading and cracking. There are many, many ways to use it. This little bottle is packed with powerful agents that fight road grime, tire dry rot and more in cars, boats, and RVs throughout the world. Over the years, we’ve heard from hundreds of happy customers who have shared new, creative uses for this product. The following helpful tips have been gathered from letters, emails, and conversations with RVers and classic car owners who always have a bottle on hand. Every year, tire “dry-rot” is a multimillion dollar problem for RVs, classic cars and stored vehicles. When a vehicle is parked for extended periods, the sidewalls and treads of its rubber tires are more likely to dry and split. 303 Tire Balm is a safe, economical way to protect tires from damaging UV rays and water and give them a rich, waxy shine. 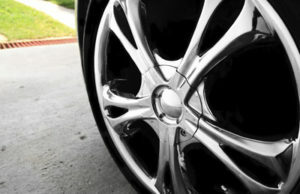 Just clean, dry and then spray until the tire sidewall is thoroughly drenched with protectant. Wait 20 minutes, then wipe with a dry rag to pick up any unabsorbed remnants. You won’t need to invest in expensive tire covers, and your tires will have the look and feel of fresh new rubber when it’s time for them to hit the road again. For a polished, shiny look, spray your vehicle’s wheels with Automotive Protectant, then wipe them completely dry with a soft, absorbent cloth. The protectant repels dirt, dust, grease, oil and road film so your wheels maintain a beautiful luster and stay cleaner longer. Best of all, it makes cleanup a breeze. 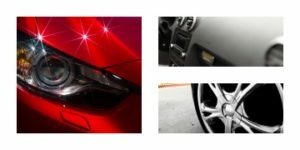 Our Automotive Protectant is 100% safe for all wheels and alloys. One quick coat of Protectant repels months’ worth of road grime. We’ve heard about this use from our RV customers: When spraying tires, apply a coat of protectant to the front of your vehicle, too. This will create an invisible shield to repel road grime and bugs—especially valuable if you’re towing a car or boat. Over time, dirt and grease cause headlights to dim. All it takes is a few months on the road for the plastic lenses to become brittle, crack and even break—not something you want to realize when you suddenly can’t see on a dark road at night. With Automotive Protectant, headlights stay brighter and last longer. The protectant has been popular with Highway Patrols for this very reason. And it takes mere minutes to apply: Just buff the lens with a dry cloth until the surface is super slick, then spray. Dealing with persistent, hard-to-locate noises in your vehicle’s dash and console? Most likely, it’s being caused by sticky-backed felt pads that hold plastic pieces of your car’s interior together—either because they’re starting to slip off or the manufacturer didn’t position them correctly in the first place. Carefully take apart all plastic pieces in the noisy area, spray liberally with Automotive Protectant and wipe dry before reassembling. You’ll be noise-free for two to four years. After cleaning your car’s treated leather seats, steering wheel wraps and trim, apply a coat of leather cleaner to prevent fading, cracking and stains. The possibilities are endless. Don’t let your bottles sit in storage half full after a single application. There are plenty of other ways to use them! Hi Neighbors ! Keith Leblanc here to give you all a great tip for preserving tires and headlights. Try taking a damp cloth and put a commercial wax on it (like bowling ball wax – which you can pick up at most sporting goods stores) and then wipe in on your tires and headlights. Buff gently and you’re good to go for 3-6 months.